Visitors to Mount Washington this weekend are in for an unreal evening on Saturday, March 5th. When the sun goes down, the boarders get amped as the eighth annual VIB Islander Afterdark Invitational promises nothing short of an “aerial assault”. Some of the very best and most daring skiers and snowboarders from across Canada will converge on the Island’s mountain in order to nab massive air and huge prizes. 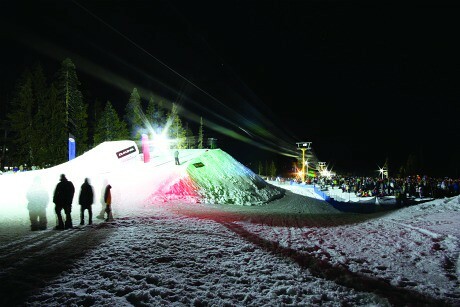 Both groups will compete on the same jump in a jam session format and have the ultimate say in who takes home the $3,000 cash prize, so this invite-only competition stays fierce the whole night through. Whether you’re competing or just catching some thrills from the sidelines, the Afterdark Invitational promises an epic time the whole night through. The VIB beer garden opens its gate at 7:00 p.m. with the competition kicking off half an hour later. Once the winner’s been crowned, the party moves into Fat Teddy’s Bar and Grill with the musical stylings of the Naked DJs and Canadian indie band Kings Without. The night is sponsored by Vancouver Island Brewery, The North Face, Dakine, and 91.3 The Zone. Make sure you plan ahead and find a safe way home. Mount Washington Alpine Resort is located at 1 Strathcona Parkway, approximately 30 minutes north of Courtenay. For more information, you can call the mountain at 1-888-231-1499, visit them online, find them on Facebook or follow the mountain’s updates on Twitter.